A few weeks back, Richard was to be in London for work, so the girl and I tagged along with him. Because we were driving, we decided to stay at the Westfield Shopping Centre in Stratford to allow us a place to park and easy access to the tube. It also was convenient for me because there was a Waitrose just below the hotel, which became our go-to for quick and healthy food for me and our girl. The two days we were there were boiling hot, so I wanted to be sure to enjoy the summer weather but also make sure that the little one was comfortable. 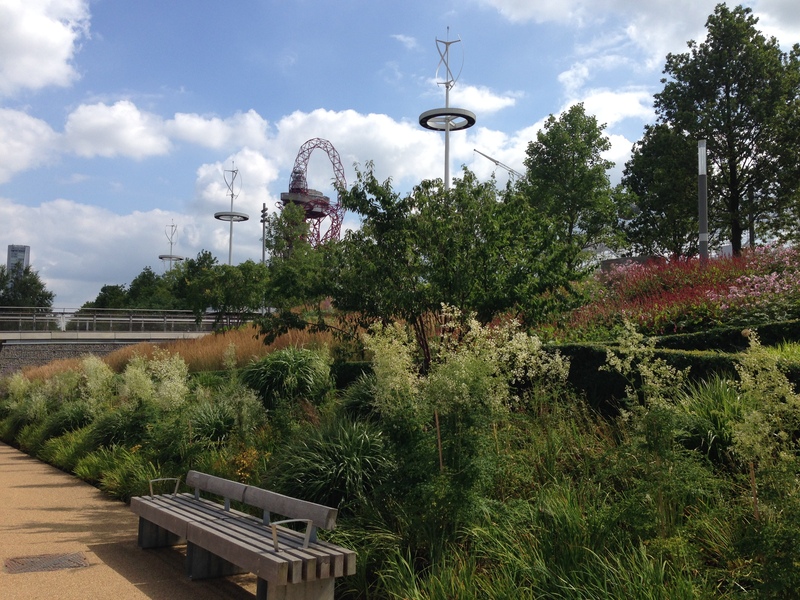 So, on the first day, we walked a 5 minutes or so to the Queen Elizabeth Olympic Park where the London 2012 Olympics were held. We wandered around enjoying the flowers and the buildings until we settled in under the shade of a tree along the river. Our girl and I had a nice little picnic, which resulted in her being covered in strawberry (her favorite food) juice! The park was a nice place for us to chill. If you have older kids, there are water fountains that squirt up at various times and it was full of kids running and laughing through the water. There is also a sand and water play area for kids. It was a pleasant surprise to see how much they have transformed the park to cater to families. 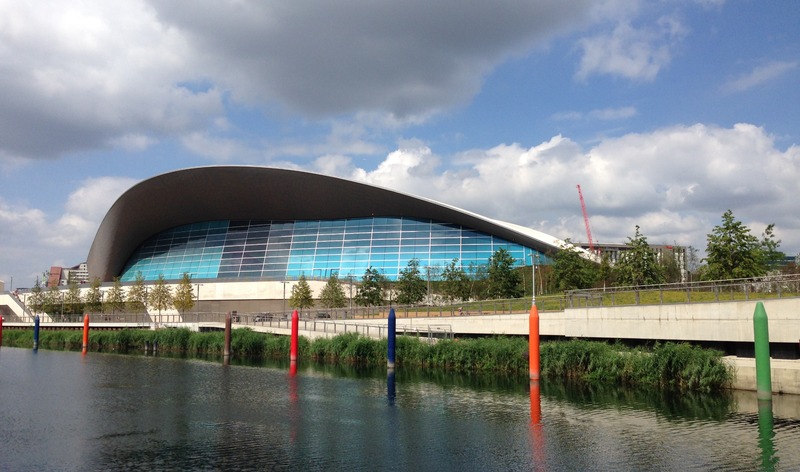 The thing I wish I had known though is that the Aquatics Centre to open to the public. How cool would it have been for us to swim in the Olympic Pool?! Next time, for sure! We walked around the park a few times during our stay and really enjoyed seeing all of the buildings we saw on television. Although we were lucky enough to watch the women’s beach volleyball finals and the women’s marathon during the Olympics, neither of those events took place in the park, so we had never made our way out there until this trip. During our walks though the park, it was always full of people enjoying the weather and the beautiful surroundings. I hope that this area continues to bring people in, and hopefully its proximity to Westfield will help with that. 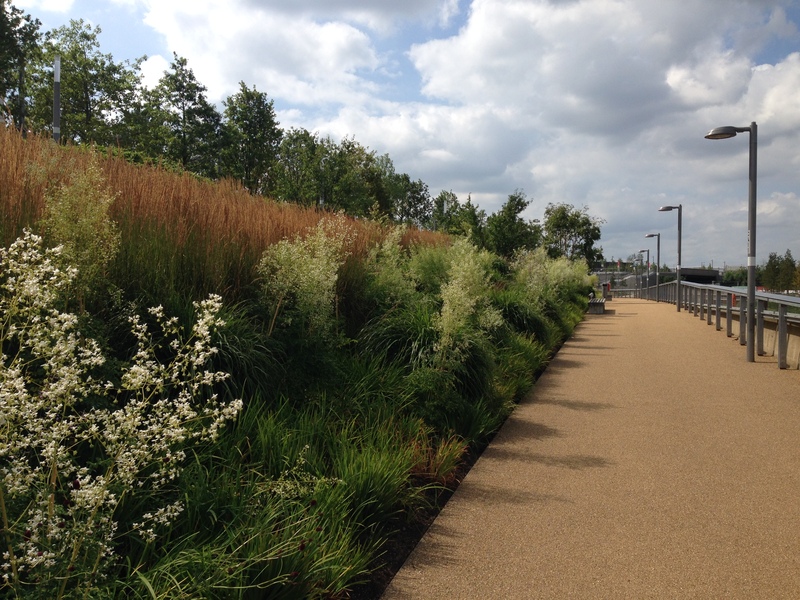 I definitely recommend checking out Queen Elizabeth Olympic Park if you have some time and are in London. It’s especially great for families. 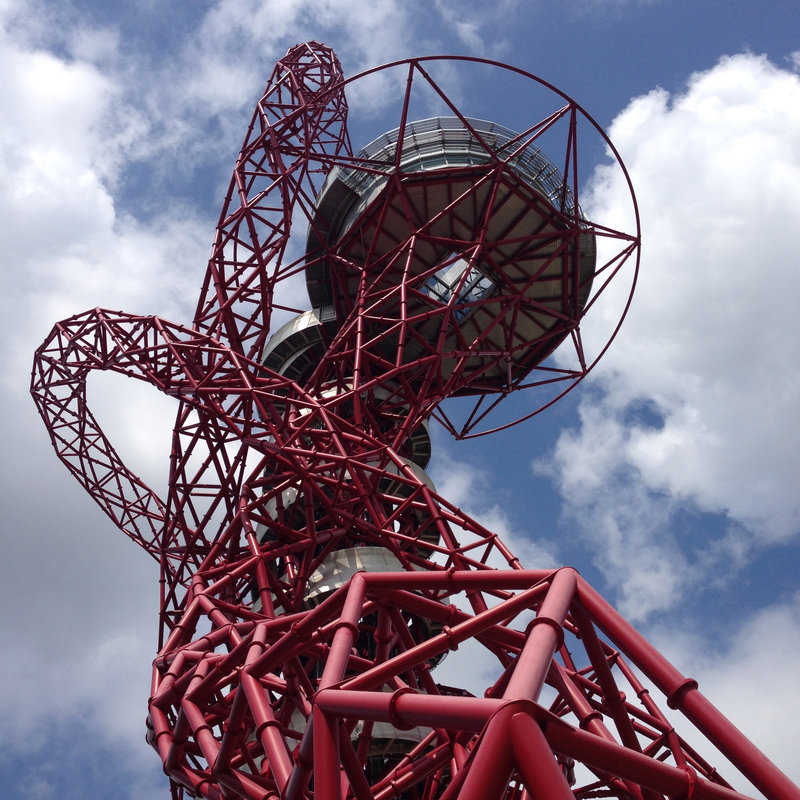 You can access it easily from Stratford Station via the DLR and the Jubilee and Central lines. With Westfield having such great access to the tube, our girl and I hopped on the Jubilee line the following day and headed to Green Park, so we could meet up with a friend who works near there. 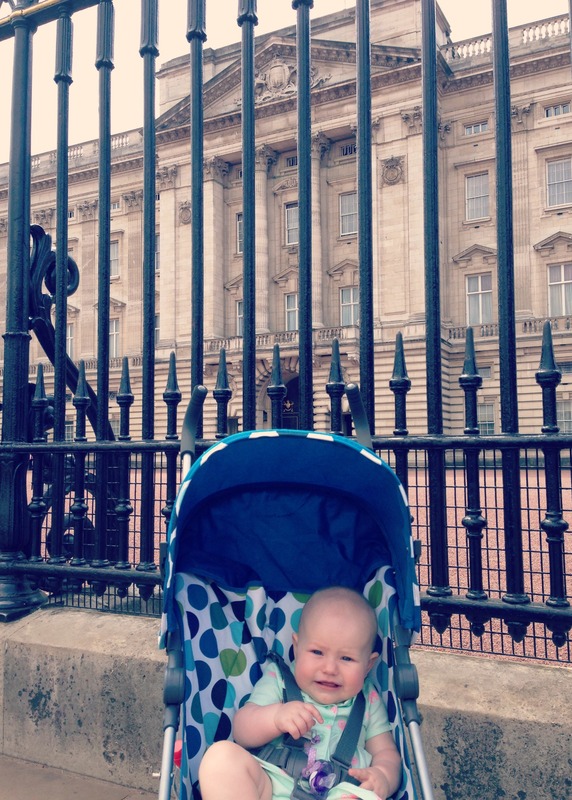 We did a little sightseeing first, and I made sure to take her picture in front of Buckingham Palace. We then headed over to St James Square for a picnic with our friend. It was a great place to get some relief from the heat and escape the busy-ness of the city during the summer. We had such a lovely time down south that we’re already planning a trip back in autumn over a weekend, so Richard can join us for our jaunts around London. Not impressed with the Palace.